I'm patting myself on the back right now. You want to know why? 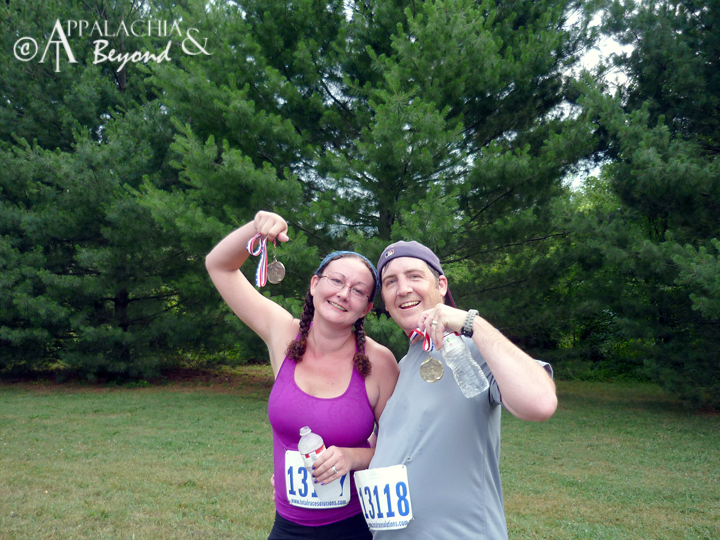 Because I completed my first 5K! Yup. 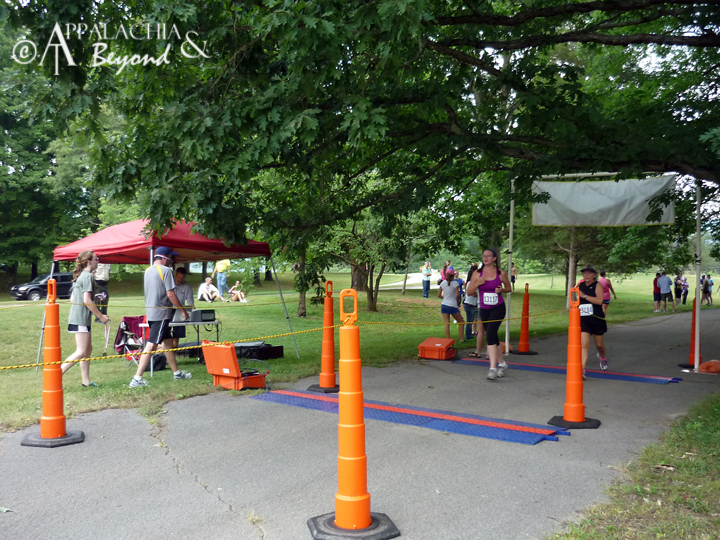 The "un-runner," the introvert, the non-competitor, the girl afraid of crowds, and (most recently) the injured ran her first race, The Cove Lake 5K, on June 16, 2012. The track for the 5K took us from the restaurant at Cove Lake State Park, down the street to the paved walking/biking trail, around it through the woods to the opening next to Cove Lake. 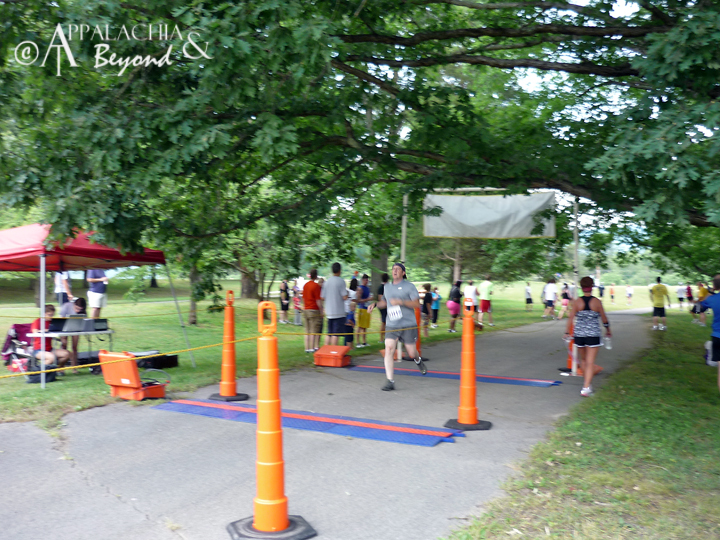 The track continued along the shoreline walkway to the open field, around and over the bridge, back around to the tennis courts, through the tunnel, and ended on the trail next to the roadway we had started from. I'm sure Tim has a map for you. Tim ran with me for a while, until it was time for me to stick with my original plan. See, we had tried to run this track a week or so before the race, and I had a ton of trouble with the hills. Not to mention, I've pulled a muscle in my back or something, and was told to take a week or so off from running. So, when it came time to run the hills, I decided it was time to walk for a bit. But I didn't want to mess up Tim's time, so I demanded insisted that he go on without me. It took a bit of persistence to get him to abandon continue without me, but eventually he did. Shortly after, I crossed the finish line, met back up with Tim, walked off the feeling of puking, and met up with my girls. Kiddo had watched Bug (with the help of my mother) while we ran the race. Later, my chip time was full explanation as to why I nearly lost my oatmeal. I finished in 40:26!!! I hadn't even ran 2 miles that quickly during training! I was ecstatic and so very proud of myself. Tim's final time was 34:41 - only a few minutes faster than me (and I did stop at one point to help a young boy who was dry heaving on the side of the trail). So... even though I have been suffering with extreme back pain ever since, I'm still proud of myself for running and completing my first 5K. And I never could have done it without the help of the best running partner in the world (even if he does leave me behind!). Thanks, Tim, for inspiring me, pushing me, and cheering me on. I've been away from the running game since before our little Bug was born. About two weeks prior, I had went for a run at Big Ridge and somehow managed to step on a rock towards the end of my run and twist my ankle. That put me out of commission for 2-3 weeks. Once Dinah entered the world I was out of commission for another 4+ months. Prior to this my last race was the Roan County Schools Run for Your Health 5K in which I completed in 27:43. This was back in November 2011. After the hiatus, I decided it was time to get back to it, after all Robin and I made a deal back a month ago. I let her go to a movie with the kiddos while I watched Bug, and in return, she let me go out for a trail run. It was on that run that I realized how much I had lost in just a short 5 month sabbatical. 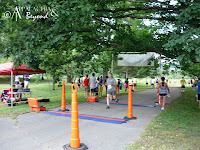 It was time to start training and I had eyeballed the Cove Lake 5K. 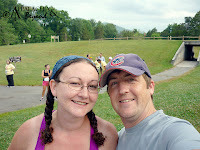 Much to my surprise, Robin decided she wanted to run with me and attempt her first 5K. So I was determined to get her and I both ready. What I didn't foresee was that just a week prior to the race, one of us would become injured and am still amazed (even though I know she is tough as nails) that Robin completed the training and finished "Her" race. As for the race report itself, what more can I add to the already great report from Robin. I started out with her and on our second walk break, as she demanded insisted, I took off without her. I walked several times myself along the track, but still finished in a respectable 34:41, 8th in my age group, which garnered 3 points in my overall points for the Run and See Tennessee Grand Prix, putting me in 6th overall in my age group. We've decided to take at least a week off so that Robin can heal. It might take a bit longer, but as soon as she's ready, we'll begin our training for the 2012 Man Run 5K in August.